This is the eighth representation of a natural system to be showcased in VC. Within the vast VC database there are only a few projects that are not a human interpretation of reality, but a direct snapshot of nature's complex beauty. The first image, taken by Andrea Ottesen, a botanist and molecular ecologist at the University of Maryland, College Park, won first place (tie) at the 2007 Science and Engineering Visualization Challenge. 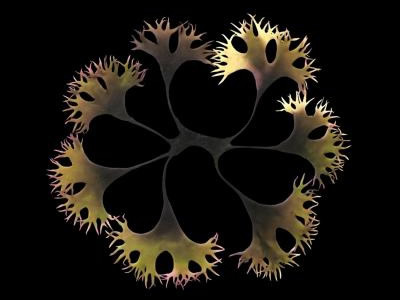 The fractal otherworldly image is of Irish moss (Chondrus crispus), a common seaweed species on the Atlantic coast. This particular specimen was captured off Cape Breton Island, Nova Scotia. 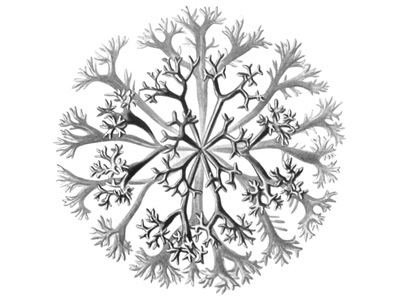 The second image is a drawing of Chondrus crispus by renowned biologist Ernst Haeckel, which appeared in the 65th plate of Haeckel's remarkable Kunstformen der Natur (1904). From Wikipedia: "Chondrus crispus, known under the common name Irish moss, or carrageen moss (Irish carraigín, "little rock"), is a species of red algae which grows abundantly along the rocky parts of the Atlantic coast of Europe and North America. In its fresh condition the plant is soft and cartilaginous, varying in color from a greenish-yellow, through red, to a dark purple or purplish-brown. The principal constituent of Irish moss is a mucilaginous body, made of the polysaccharide carrageenan of which it contains about 55%. The plant also consists of nearly 10% protein and about 15% mineral matter, and is rich in iodine and sulfur. When softened in water it has a sea-like odour, and because of the abundant cell wall polysaccharides it will form a jelly when boiled, containing from 20 to 100 times its weight of water."